Daily Spirit & Word, 453: Holy Spirit Forever. Will be with you forever. Christian LIFE in the Spirit Today. Good morning my friends, Praise the LORD! It’s the LORD’S DAY! Worship the LORD with gladness. Come before His presence with songs of joy upon your hearts. Give thanks to Him for He is GOOD. His LOVE endures forever. Amen! 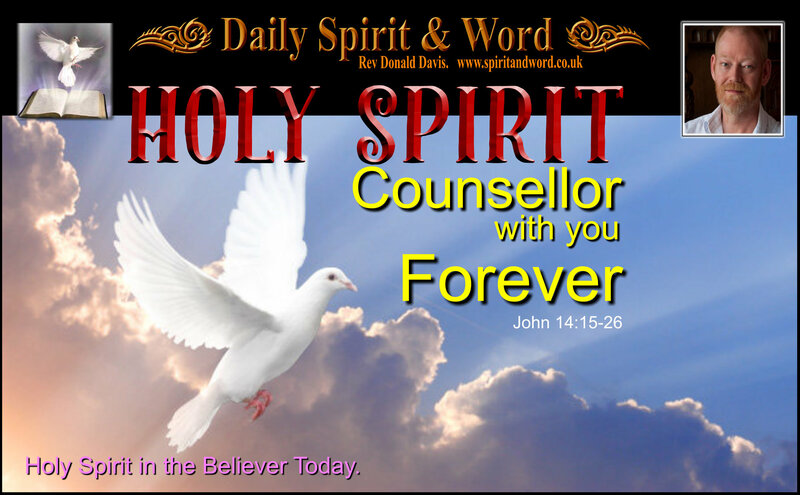 Our focus today is; The Counsellor: The Holy Spirit of Truth. “If you love me, you will obey what I command. 16 And I will ask the Father, and he will give you another Counsellor to be with you for ever— 17 the Spirit of truth. The world cannot accept him, because it neither sees him nor knows him. But you know him, for he lives with you and will be in you. 18 I will not leave you as orphans; I will come to you. 19 Before long, the world will not see me any more, but you will see me. Because I live, you also will live. 20 On that day you will realise that I am in my Father, and you are in me, and I am in you. 21 Whoever has my commands and obeys them, he is the one who loves me. He who loves me will be loved by my Father, and I too will love him and show myself to him.” 22 Then Judas (not Judas Iscariot) said, “But, Lord, why do you intend to show yourself to us and not to the world?” 23 Jesus replied, “If anyone loves me, he will obey my teaching. My Father will love him, and we will come to him and make our home with him. 24 He who does not love me will not obey my teaching. These words you hear are not my own; they belong to the Father who sent me. 25 “All this I have spoken while still with you. 26 But the Counsellor, the Holy Spirit, whom the Father will send in my name, will teach you all things and will remind you of everything I have said to you. John 14 is the great chapter in the Gospel where Jesus reveals explicitly and clearly that He’s going to be leaving the Disciples very soon. But it also reveals Jesus heart for everyone who comes and puts their trust in Him. He knows that if the Disciples were left on their own they’d soon desert Him (as they did when He was arrested, tried and crucified). Even Peter, the great rock of a man, denied Jesus when a young servant girl noticed him. Three times Peter denied Jesus, but that was before Peter was filled with the Holy Spirit, that Jesus had promised them here in this section of chapter 14 of John. You’ll notice by contrast the DIFFERENCE in Peter, when He’s been filled with the Holy Spirit on the Day of Pentecost (Acts 2). Jesus knows what it’s like to loose someone you love. He felt it when Lazarus died remember how Jesus wept; when He saw Mary and Martha and how they grieved for Lazarus? Jesus knows what it’s like. So in Chapter 14 The Gospel Writer is showing us how Jesus was preparing them for His departure; His betrayal and death. Giving them HOPE of a new life even after death. Jesus was leaving, but He’s promising something wonderful: They are going to see Him again. They are going to be filled with the Holy Spirit and as they experience the Holy Spirit they’ll KNOW: Jesus is with them, the Father is with them, the Holy Spirit is with them: Not only that God in Trinity is with EVERY true believer (a true believer is someone who has Jesus Commands / Teachings and is obedient to them), but He’s going to be IN them. Jesus said that in answer to Judas’ question about Jesus revealing Himself to the disciples. He thought that Jesus meant only the disciples would ‘see’ Jesus. Judas has a good heart, he’s concerned about EVERYONE who wants to trust in Jesus. He’s already, even before he’s got the Holy Spirit, got a heart for others. What will the Holy Spirit do? Belonging / Commands. In this chapter we’re only given a brief introduction to the great work of the Holy Spirit. His first a most important work for the believer is to help us to know that we belong to Jesus. To HAVE Jesus commands, is to have them INSIDE YOU: They become a part of your being, your nature, your everything. You’ll LOVE them, you’ll want to LIVE in obedience, complete obedience, to Jesus Commands. Note: Spiritual Conflict: Ongoing battle because even after you’ve received the Holy Spirit, you are NOT yet perfect or completely like Jesus. You still have a SIN / Fleshly Nature within you too. When you are filled with the Spirit there’s an ongoing war in your being; between your old sin nature and the New Spirit nature the Lord gives you. The Spirit and the Flesh are in conflict; each vying for your attention and obedience. Whichever one you submit to will determine your peace or not. (Romans 7 and 8). However, the way to overcome the conflict is to be filled afresh with the Holy Spirit. Explained: Yes, whenever a person comes in faith to trust the Lord Jesus as Saviour, who repents of their sins and forsakes them and begins to live in obedience to His Commands / Teachings (Discipleship), because those commands are written upon our hearts and become part of our new nature; the New Nature we receive when we’re Born Again of God’s Holy Spirit (John 1 and 3), the old nature is defeated, but it’s not dead. It’s still within you and me and everyone who trusts in Jesus. My friends, being tested about what we know is one thing, but being tested for what we are is quite another. The TEST that we experience as believers is not what we KNOW about Jesus, the Bible, Church, Traditions, etc…. It the TEST to see if we are truly His. That’s an ongoing test. It’s a TEST we’re subjected to every single day. God wants to know if you are His. Jesus wants to know if you are His. The Holy Spirit wants to know if you are His. The TEST is obedience to the Commands and Teachings of Jesus Christ (God’s WORD: Jesus is the WORD, the Holy Spirit inspired men to write down God’s WORD. God the FATHER is the ultimate source of the WORD / TRUTH / LIFE. Because the Son and the Spirit subject themselves to the Father’s will. The Holy Spirit subjects Himself to the Father and the Son. But they are ALL ONE, they are ALL equal. Perfect obedience elevates you as it did and does the Lord Jesus Christ. You’ll experience the LIFE that Jesus intends, the more you live in obedience to His commands and teachings. That Bible has so much more to say about the Person and work of the Holy Spirit than is revealed in this little portion from John today. However, here we can be comforted that He’ll guide us and reveal to us EVERYTHING Jesus had commanded whilst He was on the earth. That’s what Jesus is promising. Even if the Disciples hadn’t written the Bible (we’re so glad they did), we’d still be guided and enlightened about the teachings of Jesus Christ by God the Holy Spirit on the inside. The Holy Spirit teaches and trains us according to the will of God the Father. He’ll guide you in all your ways. When we become followers of Jesus teachings and commands, we are His Disciples (That’s what He was telling Judas), anyone, everyone who obeys. As Jesus Disciples we’re given the greatest gift; the Presence of God within, the Holy Spirit will not just be with us, he’ll be IN us. They’d already known that the Holy Spirit was with them: They’d healed, delivered and seen all the miracles of Jesus. NOW Jesus was promising them; “You’ll HAVE the Holy Spirit in you too”. This passage from John above is only an introduction to the work of the Holy Spirit. The Gospels: Reveal the PROMISE of what life is going to be like with the Holy Spirit. As does the Old Testament. The Rest of the New Testament is ALL ABOUT LIFE IN THE SPIRIT. Acts: Called the Acts of the Apostles: But could equally have the full title; “The Acts of the Apostles when they are Filled with the Holy Spirit”. Witness, Work and Life. Romans: Teaches us the Gospel, but also What Victory we have when we LIVE according to the guidance and teaching of the Holy Spirit. (Romans 7 & 8). Corinthians: Teaches us about the Gifts of the Holy Spirit. Galatians: Teaches us HOW to Walk and be LED by the Spirit, the CONFLICT between our natures and about the Fruit of the Holy Spirit in the Believers life. Ephesians: Has teaching about the Holy Spirit in every single chapter. Philippians: Teaches us about the UNITY of the Holy Spirit: Making us ONE. Collossians: Teaches us about the LOVE for others that the Holy Spirit empowers us to have. Illustrated in the Old Testament: Prophets, Priests, Kings. Promised in the Gospels: Jesus promises in John 14, 17. John the Baptist “Spirit & Fire” promised. Expanded and illustrated and Explained in the Rest of the New Testament. He convicts of sin and of righteousness: Our Need for Jesus. John 17. He Gives Believers New LIFE. He Testifies to Believers that God is our FATHER. (FAMILY). He Equips Believers to LIVE. He Guides Believers in LIFE. He Gifts Believers for SERVICE. HE Unifies BELIEVERS for BLESSING. He Fills Believers with God’s LOVE. My friends, if you’ve ever doubted that you need the Holy Spirit in your life, if you’ve ever been tempted to think, “I’ve got Jesus I don’t need anymore”, then I encourage you to think again. Re-Read the Bible with a Marker / Highlighter in your hand and whenever you come accross Holy Spirit or The Spirit: Mark it. Make a note: What is it teaching me here about the Holy Spirit, what does the Holy Spirit do in this part of the Bible? What does it teach me here about what the Holy Spirit means for a Believer. Your heart will be encouraged. I’m hoping and praying that you will be filled. I know that God has promised the Holy Spirit to all who ask. I know that once you are filled your life will never be the same again. God has promised the Holy Spirit to ALL who ask to be filled. Just pray, “Lord Jesus, I was baptised for the forgiveness of sins, I know I’ve been born of the Spirit, but now I want to be empowered and renewed and transformed by Holy Spirit today”…. Can you say that and mean it? Every blessing for a Spirit filled and powerful day.